1) Chicken soup for cold. Studies show eating chicken soup when you’re sick with a cold is good for you. Chicken soup has been observed to stop the migration of a type of white blood cells called neutrophils to the site of the infection, resulting in reduced inflammation and improved symptoms. In the case of the common cold, which is an upper respiratory infection, specific viruses infect the throat, nose, sinuses and voice box. These are the areas where the viruses multiply and, while doing so, alert the immune system. The immune system quickly sends white blood cells to fight the infection and one of the first to arrive are neutrophils. Their presence is partly responsible for the extensive inflammation that causes the common cold symptoms. Eating chicken soup inhibits their migration to the site of the infection, resulting in less inflammation and less symptoms. 2) Good for nasal congestion. Stuffiness associated with the common cold, even certain flu viruses or other respiratory infections of bacterial or viral causes can be improved by eating chicken soup. First of all, chicken soup is half liquid and this helps hydrate mucous membranes lining the nasal passages, allowing for the mucus to drain and facilitates normal breathing. Secondly, it’s usually eaten warm and the heat further helps clear stuffiness and eliminate nose mucus. Furthermore, research shows chicken soup has important anti-inflammatory benefits. And by reducing inflammation, it automatically contributes to less severe symptoms, including nasal congestion. 3) Supports healthy weight loss. Chicken soup is low in calories, if you make it right. It has boiled chicken to provide protein for creating muscle and a little fat for the brain and for beautiful skin. The variety of vegetables it incorporates supplies carbohydrates for good energy levels and fiber for great transit and an easy digestion. Noodles, should you choose to add them, also provide energy. And the fact that chicken soup is half water, contributes to curbing hunger. The chicken, the vegetables and the noodles are low-calorie which makes the chicken soup also low-calorie, perfect for losing weight. Even more, chicken meat is rich in B vitamins that support nervous system activity and digestion, has iron for muscle energy and a wide variety of vitamins from vegetables, making chicken soup both low-calorie and nutritious, ideal for healthy weight loss. Just remember to not add extra fat or oil to the soup (the chicken is enough), skip sour cream and avoid frying the vegetables in butter, or oil as boiling them is enough to give flavor to the soup. 4) Chicken soup and gout. Eating some chicken soup every now and then is actually good for you even if you have gout, as long as you watch the rest of your diet. Chicken soup is bad for gout only if you eat too much of it too often or have a diet already rich in animal products high in purines in which case you already get enough nutrition and sufficient problematic purines as it is. The advantage of chicken soup is that it also has healthy vegetables that help manage gout flare ups, is low in calories for weight management, also important in gout, and it doesn’t actually fill you up on chicken meat, but rather vegetables and fluids, the amount of meat you eat being moderate. 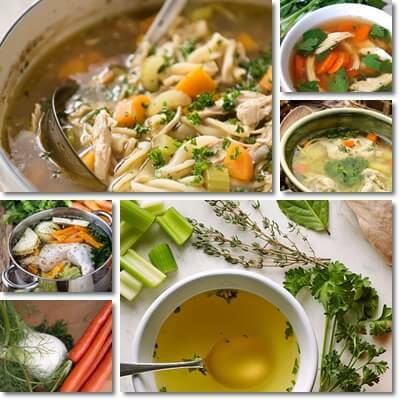 And since you do need some quality protein and hearty sources of B vitamins to be in good healthy, chicken soup is a good compromise with minimal side effects. The idea is that chicken soup is preferable to other foods rich in purines. Not to mention it’s easier to fill up on fried shrimp, pork steak, beef burger and hot wings than it is on chicken from soup. To make your chicken soup good for gout, don’t add sour cream, grated cheese and leave out the eggs. More important, avoid organ meats because of their high content of purines. 5) Good for anemia. While a pork steak, a beef burger and eggs are far better sources of iron to combat anemia, chicken soup is just as great, without all the fat. You can make a great chicken soup for anemia by substituting legs or whole chicken with liver, gizzards and hearts, maybe add a couple of wings to get some fat too. Innards, particularly liver, are richest in iron and effectively combat fatigue, lethargy and muscle weakness caused by anemia. Moreover, they are excellent sources of B vitamins, especially vitamins B12 and B9, for a boost in energy. Fresh parsley in chicken soup ups its iron content. See Properties and Benefits of Parsley. But you’d also need a slice of lime or a few unripe and sour cherry plums to get some vitamin C to be able to absorb it well. Adding some whisked eggs at the end of the cooking process further increases the iron and vitamin B12 content of your chicken soup. 6) Combats dehydration. Chicken soup is half liquid, or at least it should be. This alone makes it healthy because it allows anyone to up their intake of fluids and stay hydrated. Not to mention the stock is infused with vitamins, minerals and other healthy elements from the ingredients used, further adding to its benefits. Chicken soup is good to eat if you have the common cold, the flu, a simple hoarseness or the stomach flu. See what to eat when you have the stomach flu. 7) Chicken soup for constipation. There are three ways chicken soup helps with constipation: first, by providing fiber, secondly, by upping water intake and third, by providing small amounts of fat. Any vegetables you add to chicken soup will add to your intake of dietary fiber and help you have softer stools that are easy to pass, which is the exact opposite of constipation. The fat infused in the stock from the chicken further helps transit. Moreover, chicken soup is half water which is great because fiber needs water to work and relieve constipation. To make chicken soup even better for constipation, add vegetables such as beans, lentils, corn, peas or greens such as spinach, sorrel or patience dock for more fiber.